This still from a NASA video shows a spacecraft's-eye view as a capture bag swallows an asteroid in order to return it to Earth. NASA plans to retrieve an asteroid and park it near the moon by 2025, possibly even by 2021, so astronauts can explore it. Capturing an asteroid may not be as difficult or expensive as NASA had thought. The space agency is currently planning out a bold mission to snag an asteroid and drag it to a stable orbit near Earth, where it could be visited repeatedly by astronauts for scientific and exploration purposes. The best way to do this may be to chase down one of the "minimoons" that zip around our planet temporarily before zipping back off into deep space, some researchers say. "This has the promise to help achieve NASA's human spaceflight goals, but at lower cost and reduced risk than the [other] things that are being presented today," Bottke added. Minimoons are tiny asteroids — often just 3 feet (1 meter) or so across — that are temporarily captured by Earth's gravity. They loop around our planet in crazy orbits, pulled this way and that by Earth, the moon and the sun before finally breaking free and flying off into deep space, typically after a year or so. While just one minimoon has been spotted to date, computer simulations suggest that they're quite common. In fact, Earth likely has several minimoons that would make good targets at any one time, Bottke said. As currently envisioned, NASA's asteroid-retrieval mission (ARM) aims to send a robotic probe out to rendezvous with a roughly 25-foot-wide (7.6 meters) space rock, then drag into a stable lunar orbit. Astronauts would then fly out to the asteroid using NASA's Orion capsule and huge Space Launch System rocket, which are slated to fly crews together for the first time in 2021. But going after a minimoon would likely be easier and cheaper while still returning quality science, advocates say. 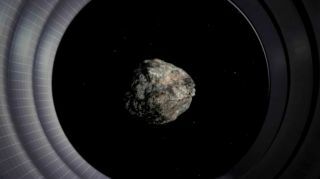 "They're smaller asteroids that are easier to capture, easier to bring back, easier to de-spin," said Robert Jedicke of the University of Hawaii, who presented with Bottke at the workshop Monday. "And scientifically, it would be extremely interesting to bring back an entire intact 1.5-meter, 1-meter diameter asteroid, bring it back to the Earth." The inherent orbital transience of minimoons would not be a serious hindrance, Bottke said. "Keep in mind — if you had a robotic precursor go out to these objects, you could very easily stabiliize them," he said. "It doesn't take much of a velocity kick to actually put them into an orbit that will last 100 years or so. So in a sense, you can think about them almost as a mini-ARM, being able to do lots of interesting things." Of course, planning out a minimoon mission would require finding more of the tiny, captured space rocks. A space-based survey would be ideal for locating potential targets, Jedicke said, but good hunting can be done from the ground as well using instruments like the Subaru Telescope in Hawaii.